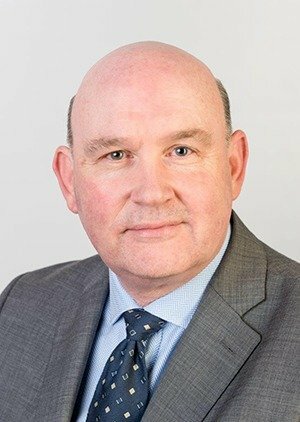 So we know our new West of England Combined Authority (WECA), and our new metro Mayor, Conservative Tim Bowles, will soon be celebrating being two years old. What are they for? 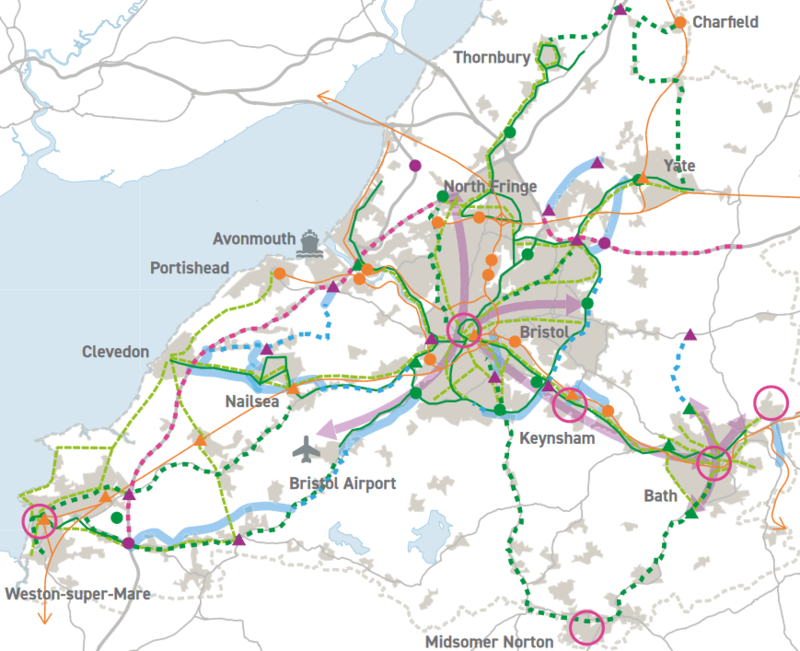 Well they currently have a Consultation on a plan for transport (called the JLTP) throughout the region up to 2036. Wow an opportunity to make our streets safe and healthy for people and kids. Reduce motor dependency, clean up air quality and create green space; well may be not. The author of the JLTP probably spent their childhood playing Grand Theft Auto in a dark place, not messing about on a bike. Certainly there’s much more emphasis on Airliners and Motorway junctions than people and mobility. True, there’s something for everyone but it could have been so much more. Frankly it’s the sort of document which might have been written in the Sixties. That’s a missed opportunity when elsewhere Highway Authorities have entered the Twenty First Century with plans to restrict non essential car travel to enable access for essential vehicles. We’ve met with Officers, failing to get any commitments, but it is early days. In the general comments at the end please call for a comprehensive, continuous cycle route network, separate from motors, including buses, and pedestrians. Thanks you for taking time to support our efforts by using this Simulator. For all those campaigning for Space for Cycling, Brian Deegan is a hero, being the transport planning engineer who has delivered top quality infrastructure in London. But he says that without a ‘big gun’ cycling champion even skilled and committed council officers can’t transform our streets to make them more suitable to cyclists (and everyone), they can only deliver tinkering half-measures (The world needs more cycling champions). 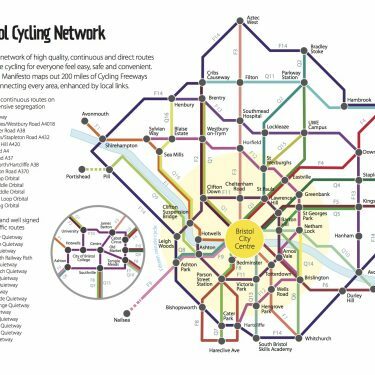 So where does that leave us in campaigning to make Bristol better for cycling? We have warm words and undoubted personal commitment from Councillors, Mayor Marvin Rees and his transport lead Mhairi Threlfall, but a black hole in West of England Combined Authority Mayor Tim Bowles (and see this from Cycle Bath). But there is a consistent failure to set out an ambitious strategy, and worse, backing off from any controversy (Prince St Bridge? Easton Safer Streets? Victoria Park?). Who would you suggest can cut through the complacency towards transformation? Or are there other changes needed? 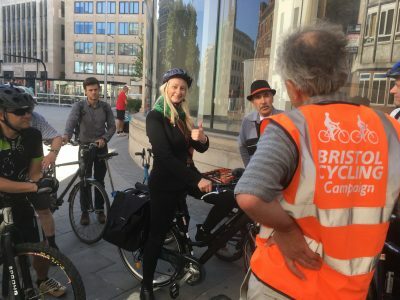 Since the elections for the ‘Metro Mayor’ in 2017 and the setting up of the West of England Combined Authority (WECA), Bristol Cycling has been working with our friends at Cycle Bath on a Cycling Manifesto for the region. We’ve been asking for the same level of commitment from Mayor Tim Bowles, and his Transport supremo, James White, as is being seen in other cities, notably London and now Manchester where Chris Boardman is the cycling champion. Sadly there is little sign of any real vision or ambition. WECA transport policy seems to be simply about junction 18A of the M4, buses, and trains. There is no recognition that walking and cycling play any role in tackling congestion. Adam Reynolds, chair of Cycle Bath, is making a joint statement to the WECA Overview and Scrutiny Committee tomorrow, Weds 21st March. On top of this we have estimates that congestion is costing Bath and Bristol businesses £55 million per year and costing individuals residents upwards of £1,500 per year in time and costs. We’re talking congestion costs reaching almost £300 million per year across Bath and Bristol, and god knows what costs the NHS are occuring due to air pollution and obesity. Cycling as a form of transport offers significant benefits to tackling congestion and improving public health. The Mayor can tackle congestion cheaply by simply identifying all Key Road Network routes where significant numbers are travelling to work by car that could travel to work by bicycle in under 20 minutes and prioritise the building of good seperate protected space for walking, cycling, and driving along these routes over the provision of on-street parking.